“I joined the team because it is a perfect fit for where I am in skiing right now, and because the coaches are awesome and will do anything to help you become a better skier,” said Freshman Justin Kinner of Casper, WY. “But mainly I joined the team because of how close it is, that’s something that you just wouldn’t get anywhere else." Do you enjoy Nordic skiing? Can you see yourself continuing to ski through your college years? Would you like to meet other individual’s with interests similar to those of your own? Are you a fan of traveling to amazing, snow filled places around the state and country? If you answered yes to these questions then the UW Nordic ski team is the right choice for you. When polled as to whether skiing for the University of Wyoming has enhanced their college experiences, athlete responses were unanimous. In fact, many team members claimed that skiing for UW has made their college experience. Through skiing, members of the team have found a great activity to fall back on after a long day of classes. 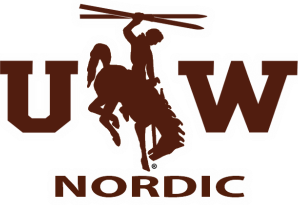 If skiing is a part of your life and you’d like to keep it that way please don’t hesitate to contact us to find out more about what the University of Wyoming Nordic ski team has to offer to you individually. To request information from the UW Nordic Team please fill out the informational form at https://spreadsheets.google.com/viewform?formkey=cFBIb0lZMXgzQnJobDBBR2lQUDN1SFE6MA..